There is this saying that "our camera eats before us", I'm certain that we have at least heard it once before. I'm one of those people. I feed my camera before myself. I'm not a social media junkie or phone addict, I just like remembering where I been too and sharing my food experience with my friends. When we experience something amazing, we tend to share it to people that's close to us right? First off, let me just start by expressing how sorry I am from MIA on my blog. I been busy with college, work and internet hasn't been good. When ever there is connection is when I am about to sleep. So hope you all understand why I blog less now. It ain't because I'm lazy but because it has been rather difficult with all of the given circumstances. I wish some internet telco would read this and want to do a collaboration with me. haha. A blogger can only dream right? Anyways, early April I got the privilege of going to Kampachi for a food tasting session with Opensnap. What is OpenSnap? 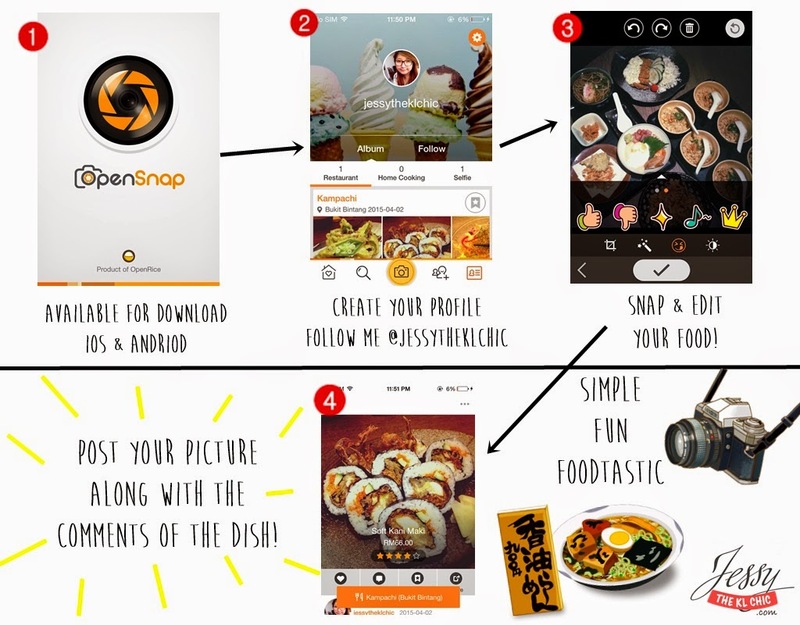 It's a food app that allows you to post, edit and share pictures of your amazing meal along with your comments of your dining experience. Its super easy to share or to look for food and restaurant. Now on with the award winning Kampachi food review. Kampachi Japanese Restaurant is known for their fresh sashimi from Tsukji Market in Tokyo. After an amazing response from their initial restaurant which is at Hotel Equatorial KL, they now also have 4 other outlets around Malaysia, which is found at The Troika, Pavilion, Johor Premium Outlets and Plaza33. After having a long tradition of their 8 year menu, Kampachi just launched their new menu and all of the food below are from the new menu. The first thing I noticed from the restaurant was the art decoration on the ceiling, as there was a hidden geisha in the drawing. Felt like a story was being told staring into the drawing. It's the little things that people remember. Their restaurant is really huge. Didn't know they could fit so many tables when I at the entrance. They have a sushi bar, cushion table chair corners and other long tables. If only their wooden chairs were more user friendly tho, my handbag kept falling down from the back of my chair until the waiter dragged another chair for me. So girls, be careful with your bags! We had a total of 6 dishes serve to us from the appetizer, sushi, main course and even desserts! First up was the Kampachi Salad. I never had salmon fried skin before. It was so crispy and sort of taste like chicken. Actually if no one told me it was salmon skin, I would have assume it was fried seaweed. It really looks like it and I guess I was just hoping it was. I love fried seaweed btw. Enoki mushroom with crispy salmon skin, lotus roots chips, deep-fried white bait served with homemade dressing. Btw this dish was served in individual portion. Thinly Sliced Amberjack with Mizuna, Carpaccio Dressing & Crispy Garlic Crisp. The sweet dressing is a great combination with the Mizuna. I couldn't resist not taking a second piece for this dish. Deep-fried eel wrapped with Perilla leaf tempura. Pretty much like a fried salad. Their unagi was fresh and chewy. Would have a love to have more. Do note that the ala-carte portion is a little small. Deep-fried chicken cutlet marinated with soy vinegar served with cabbage salad, home-made Japanese style tartar sauce. OMG the sauce for this was amazing. Am still thinking about this dish today. Cherry shrimp tempura. This is a very dangerous dish, all of us couldn't stop munching this and in minutes, the entire dish was gone. If you got a group of friends and would like to snack on something, I recommend this dish. Cherry shrimp tempura & noodles with Japanese mountain yam, assorted cube-cut raw fish and egg. If you're hungry or have a big appetite, I recommend this dish! You see the bowl with egg and raw salmon? There is rice and yam under it! That entire bowl of ingredients are require to mix and stir before consumption. Tho your dish would look ugly but the taste after mixture would be like swimming in the ocean. Love the variety of taste and the fresh salmon. Also their set is really worth ordering. Lots of my friends, usually come here for the set. Kampachi is a Japanese Restaurant that priced a little above average. Usually during dinner time, the place is pack. I was there during a weekday and there were a lot of people. Like I said before, they are known for their fresh salmon. They have a reputation of bringing in authentic Japanese cuisine. Their service there is really good, you will find fast and friendly staff there. So if you're thinking of a place to splurge or a nice place to celebrate an anniversary or a birthday, this place would be perfect. It was an enjoyable dinner with Opensnap. Do let me know your Kampachi experience too! Have a zen week ahead! Yummy! Used the app for a review at Antipodean recently too. Event: Nuffnang 8th Birthday Bash!